What is the most important key to understanding Bible prophecy? Dr. Reagan: If you were telling somebody what the most important key to understanding Bible prophecy is, since there's so much misunderstanding, what would the key to understanding it be? Dennis Pollock: The key is actually something that I've heard you say so many times over — if the plain sense makes sense you don't look for any other sense, or you will end up with nonsense. In other words, what you do is unless the passage or prophecy is just shouting and screaming, "I'm an illustration, I'm a symbol," then you take it at face value. You will come up with a far more accurate perspective than if you decide every prophetic passage has to be translated by me and I will figure out exactly what God is saying. Dr. Reagan: That would make you God, right? Dennis Pollock: It would make me God. Let me give you an example. In Zechariah 14 it says the Lord is going to fight against the nations that have come against Jerusalem. It says His feet are going to stand on the Mount of Olives. It says living water is going to come forth and flow from Jerusalem. And, He will be the King and Lord over the whole earth. Now, let me give you the Dennis Pollock translation and interpretation these deep passages. Here is what I believe it is saying. The Lord will go forth and fight against the nations that come against Jerusalem. His feet are going to stand on the Mount of Olives. Living waters are going to flow from Jerusalem. And, Jesus will be King over the whole earth. Now, I know that's incredibly profound, but I'm taking the safe route which is to believe that what the Bible says is true. Dr. Reagan: That would make you a fundamentalist! But, Dennis, the point of the matter is that same book of Zechariah has all kinds of First Coming prophecies, and every one of them have meant what they said. They said the Messiah was going to come humbly on a donkey and be hailed as a King. Today's allegorizers would say, "Well, no, that does not mean He is going to come on a donkey. It just means He is going to be a humble person." But, no, He came riding on a donkey. Dennis Pollock: That's exactly right. 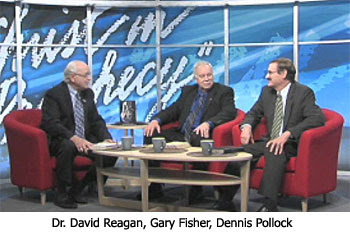 Dr. Reagan: If the First Coming prophecies meant what they said, then why don't the Second Coming ones mean what they say? What would you say about this? Gary Fisher: My answer to this is — believe the Bible as it is written. I was having lunch with a pastor one day and we were talking about this very issue. I knew we were in trouble when we got to lunch. He slid this booklet across the table and he told me, "This is the latest booklet that I wrote on Bible prophecy." He looked at me and declared, "Gary, I studied these things and I respectfully just believe you are wrong." I asked, "Wrong about what part?" He stated, "Jesus is never going coming back to this earth." Well, I said, "Brother, Zechariah 14:4 says that the Messiah's feet one day will touch down on the Mount of Olives." He replied, "Don't you understand that is just talking about the born again experience." I had to say humorously, "No, I didn't understand that." I believe Zechariah just like Dennis read a few moments ago. I believe it will happen exactly like Zechariah says it will. C.I. Scofield was one of my heroes on this issue. He wrote that he didn't quite understand Ezekiel 38-39, that Russia was going to attack Israel in the last days. That was back in 1908. At that time Israel didn't exist and Russia was a Christian nation. But, he believed the Bible as it was written. We will be on safe ground if we do so as well. Dennis Pollock: You remember when the wise men came to Herod. They were wanting a little more info about where this king was going to be born. Herod called for the scribes and asked something like, "Hey, Guys, you study the Scriptures. Where do you suppose the Messiah is going to be born?" What did they tell him? They answered that it would be in Bethlehem of Judea. How in the world did they figure that out? They read the Old Testament and it said, "From you Bethlehem Ephrathah will come forth a ruler." So, they read the Scripture and they believed exactly as it reads. They nailed it! They got it dead on, and that's how we should also understand Bible prophecy. Dr. Reagan: The only thing I would add to what you all have said is that principle should apply to all the Bible, not just to Bible prophecy, but to all the Bible. Just take the Bible for its plain sense meaning. God wants to communicate. He knows how to communicate. You don't have to have a Ph.D. in hermeneutics or imagination in order to understand God's Word. In the next part of this series covering prophecy questions, our panel will explain the errors behind the Amillennial and Post-Millennial views of Christ's reign on earth. Just want to say a huge 'Amen' of agreement on this subject. My neighbor is an Exclusive Brethren and she is adamant that Jesus is "too holy to ever put his feet back on this earth". I was so surprised, I could only ineffectively stutter "Mount of Olives", and a very garbled “Bosrah” before she quickly side-stepped and changed the subject entirely. I can only suppose she thinks, like Emergent, that Jesus is ruling from heaven right now? Which neatly leads to the question; has Dr Reagan done a Bible study about David’s throne – that its on earth, it's still future and that Jesus is not reigning from it now? God is TRUTH and everything he tells us through the prophets etc. is amazing. I also notice how in the Old and New Testament how the natural and physical world is used to explain the spiritual. For example the physical Ark in Noah's time saved his family but it also shows us how the "ark", of the salvation in Jesus, will save us when the physical and spiritual floods come. I love reading the bible literally ,because I believe it to be Truth, but I also see the divine truth in the spiritual. God will always give us what we need and being physical beings with a spiritual nature, "in God's image", He expresses Himself, at least to me, in both ways. What an awesome God we serve. Thanks for listening.